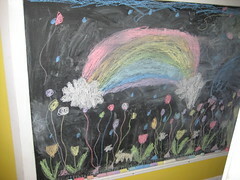 Nutmeg made this springtime scene on the chalkboard Epu made in the hallway. Blue sky, tulips, a rainbow, and, what the heck, balloons everywhere. I'd take the whole shebang right about now.